This week saw a repeat of the very familiar pattern when the South Atlantic high first intrudes Namibian weather from the west, then slips to the south, gathering strength. During the migration from west to east, the windflow changes from west to south-westerly, then south, then south-easterly, and finally, about three days later to easterly. This 180o swing-around of the wind direction depends on the relative position of the high pressure cell. When over the Atlantic, it is west of Namibia and the cold comes from the west. As the high moves closer to the continent, it is opposed and dispelled (in the upper layers) by warmer lower pressure conditions from the north. This forces the core of the high southward, slipping around the Cape. When it is south of Agulhas, the wind and the cold comes from the south. As the high moves east, it tends to the extend northward again, covering eastern South Africa, and the Mozambican Channel. Since it is then east of Namibia, the cold intrusion has swung around and now comes from the east, somewhat against expectations. This high rotates anti-clockwise very slowly, but at the same time, when it is situated over land, it quickly heats up. The anti-clockwise rotation, however, remains, and it is the northern rim of this high that brings the airflow from the north-east across the Zambezi, and eventually directly from the north. In the wake of this migrating high, a low pressure area forms over southern Angola. The rotation of the departing high is the driving engine that brings this low pressure area into Namibia along the lower Kunene from where it usually moves towards the south along the coastal plain bringing windy and dusty conditions to the northern Namib up to the Kuiseb valley. At the same time, because the barometric pressure is lower, it rises vertically morphing into a trough in the mid and upper levels, and moves across Namibia from the Kunene towards the Kalahari in the south-east. 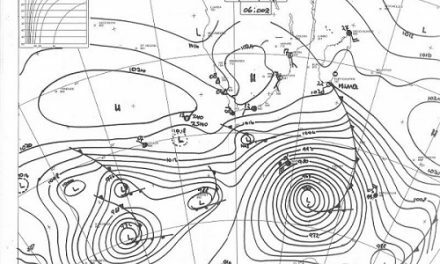 This pattern is a text book description of this week’s weather over Namibia. Monday, Tuesday and Wednesday were a battle for supremacy. The outer rim of the South Atlantic High pressure cell controlled conditions on the surface up to a line running more or less from Swartbooisdrift to Ariamsvlei. Wind direction south of this line was from the south west. North of this line, wind direction was east, then north-easterly and finally north. This lead to a marked difference in surface temperatures between Karas in the South, and Owamboland and the Kavango in the north. By Friday, the high has shifted far enough east to act as a major conveyor of colder air from south to north up the Mozambican channel. This massive volume of air blowing north curves back from the Indian ocean, crosses Mozambique, Zimbabwe and Zambia, and causes the warmer airflow from the north-east and the north over the northern half of Namibia. The southern Indian high pressure cell that remained stuck south-east of Madagascar is finally dislodged by the strength of the approaching South Atlantic high. As this high slips around the southern perimeter of the continent, it pushes along a formidable vortex, which lies due south of Madagascar by Friday. As the weekend starts, this vortex has moved marginally further east, weakening the approaching high pressure cell. This high, over southern Mozambique and the South African highveld by Saturday, drives a strong airflow across Namibia from north to south. The Namibian airspace is split into two, western and eastern, with lower pressure (windy, dusty conditions) over the northern and central Namib, and warm, quiet conditions in the eastern half up to the Botswana border. The interaction between the opposing systems from the north and from the south creates a convergence line in the mid and upper levels advecting limited moisture into the Karas region, but at an elevation above 18,000 feet. There is a small chance of light rain over the Karas region on Saturday, Sunday, Monday and Tuesday. Whether anything will reach the ground is another matter, due to the elevation of the convergence line. Virga is a typical occurrence for September.